Broadway and Flushing Avenue under the elevated JMZ subway line in Brooklyn. 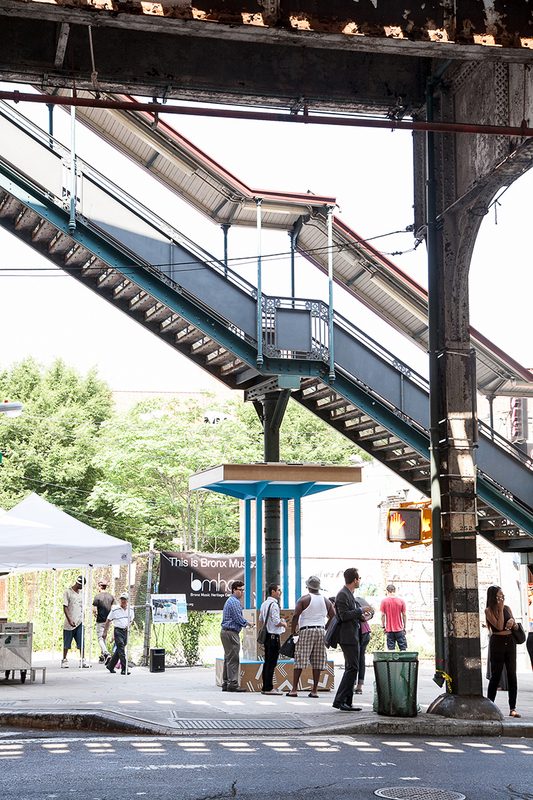 Most of New York City’s elevated infrastructure is in fact located outside Manhattan in low-income neighborhoods, DOT Commissioner Polly Trottenberg said, noting that the Design Trust’s initiative dovetails with New York City Mayor Bill de Blasio’s agenda for developing public open spaces in underserved communities. Looking at the remnant of the Miller Highway viaduct overhead, which once ran all the way to the tip of Lower Manhattan and was one of the first elevated highways in the country, I was struck by how, in the early 20th century, such obtrusive structures symbolized progress. At the time, they were viewed as a means to improve traffic safety and to reduce traffic congestion. However, there were significant social and environmental costs—many of these structures were either rammed through low-income neighborhoods or were built in places that, at the time, were part of the city’s industrial waterfront. Later, in gentrifying areas of Manhattan, many of the elevated highway and subway viaducts were torn down at enormous expense. Division Street pop-up installation in Chinatown. In recent years, there have been several notable examples of remaking spaces beneath elevated infrastructure. 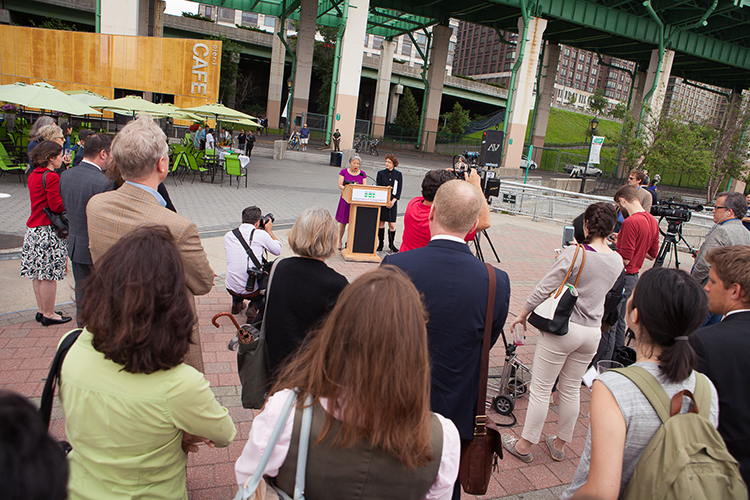 The space beneath the Miller Highway viaduct became a leg of the Manhattan Waterfront Greenway. And then there are some of the formerly underused spaces beneath the High Line, which have been brought to life with fashionable restaurants and public plazas. The Boogie Down Booth pop-up installation under the stairway to the 2/5 elevated subway line at Freeman Street in the Bronx. Under the Elevated contains seven illustrated case studies for redesigning spaces underneath structures throughout New York City and describes two pop-up installations where Design Trust Fellows, the private-sector professionals who lead research, design, and planning for trust projects, tested some of their ideas. 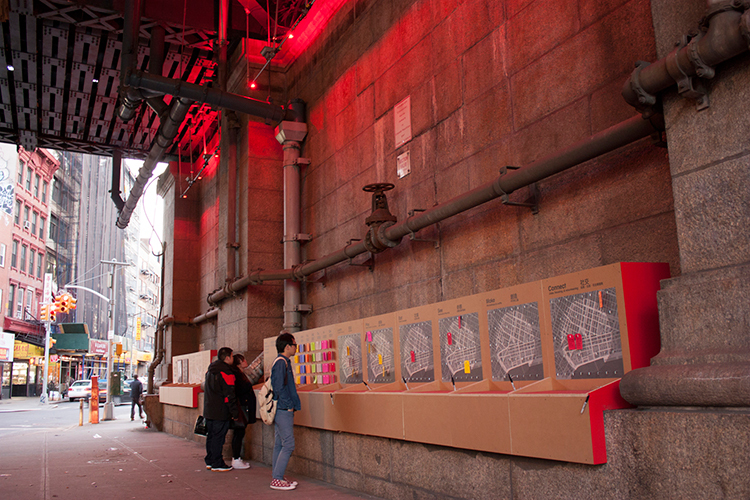 One was in Chinatown under one of the Manhattan Bridge’s massive arches, where the team installed lighting, seating, and a bulletin board for local residents to post messages about events. 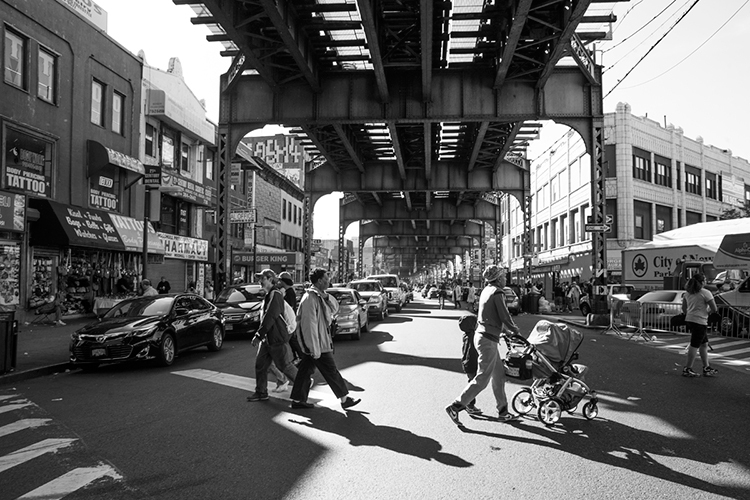 Under an elevated train trestle in the Morrisania neighborhood in the South Bronx, the Design Trust worked with a community-based development corporation, WHEDco, to design the Boogie Down Booth, a performance venue and gathering place illuminated by LED lights that plays local music. 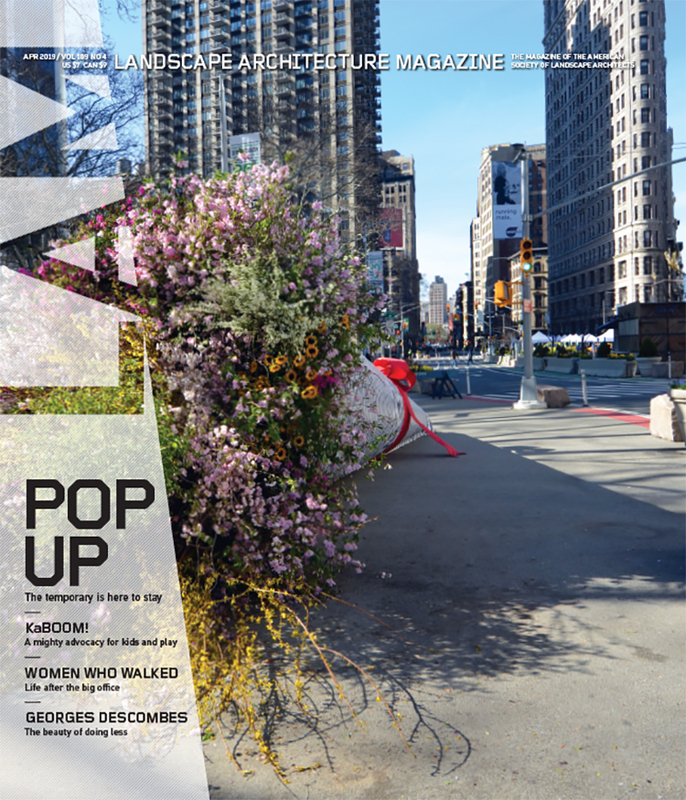 Under the Elevated: Reclaiming Space, Connecting Communities is available for purchase online at Design Trust for Public Space’s website. Alex Ulam is a freelance journalist who writes frequently on architecture and design. His work has been published in the New York Times, the Nation magazine, Maclean’s, and other publications. Credits: Launch Event, Sam Lahoz, courtesy of the Design Trust for Public Space; Broadway and Flushing Avenue, © Krisanne Johnson for the Design Trust for Public Space; Division Street, Neil Donnelly, courtesy of the Design Trust for Public Space; Boogie Down Booth, William Michael Fredericks, courtesy of the Design Trust for Public Space.